Overlooking the small County Carlow town of Bagenalstown, not far off the top of the south facing hillside with a wide view over the northern lowlands, a large boulder bearing some remarkable carvings now rests within the undergrowth among the piled clearance of the surrounding fields. 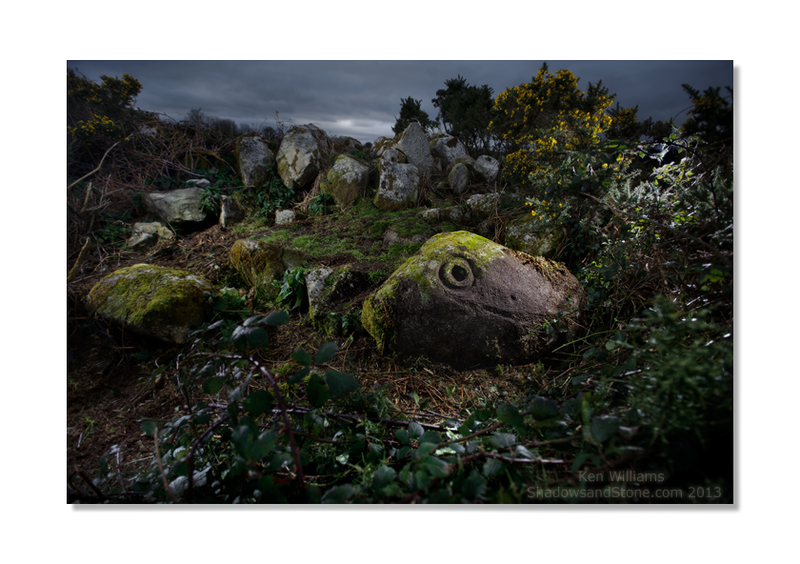 This is an elusive boulder, my previous attempt resulted in total failure and torn wet gear as I made my way back to the road in the late twilight. This was not unexpected as I had heard that it had been only rediscovered several years ago after a number of repeated visits and much hacking through the thick hedgerow. It was more a stroke of luck that I came across it in the end, having almost reached the limit of the rough ground in which it was supposed to be found. The boulder ‘as found’, though as bad as it looks it only took about ten minutes of hacking to free the stone from the undergrowth. As usual, click on any photo to see a larger version. 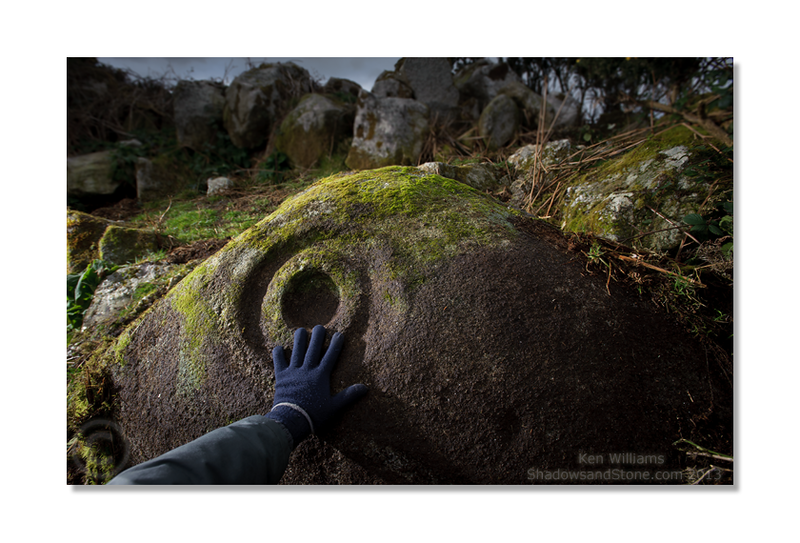 It is most certainly worth the effort, the sheer size and depth of the motifs cut from the hard granite makes this a particularly fine example of the ‘cup and ring’ genre, a style of preshistoric decoration found in the open air on boulders or outcrops. It seems a widely distributed tradition, with broadly similar examples found across a wide geographical area along the Atlantic Seaboard from Galicia in north west Iberia, through areas of Ireland, into Northern England and Scotland. True to the ‘diffusionist’ explanations of the time, it was thought the tradition originated on the continent before spreading to Ireland and the British Isles during the Bronze Age (eg. MacWhite, 1946). 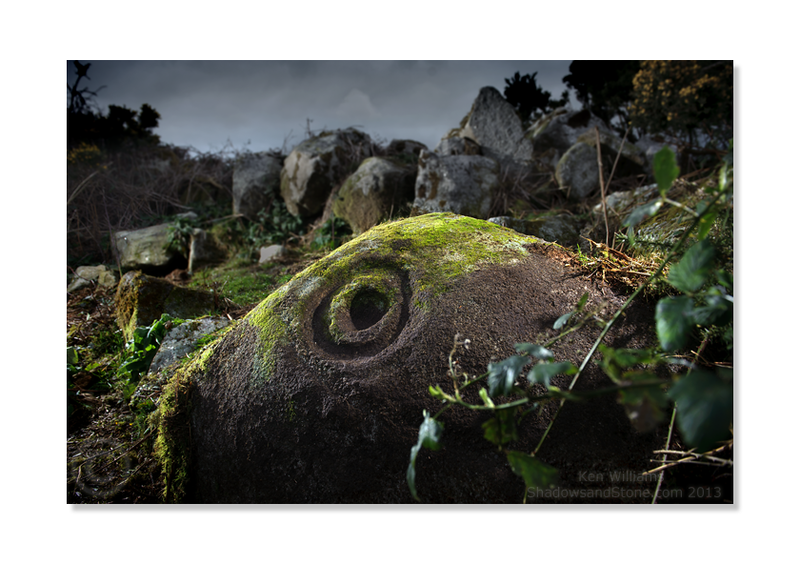 For this reason it is often still termed ‘Galician-Style Rock Art’ or just ‘Galician Rock Art’, though there can be significant regional variations on the basic ‘cup and ring’ theme. Seemingly comparable designs can also be found in Northern Italy and in the Alps, while the concentric circle motif and simple cup marks appear in many archaic rock art traditions worldwide. Its dating and function are still much discussed and debated, though some consensus that the tradition stretches over a long period beginning in the early Neolithic (approx. 3500-4000BC) has become established in the last decade. A large vein of quartz runs the entire surface of the stone, forming a curve at one end that partly encloses the cup and ring. This feature is particularly visible in the photo below. 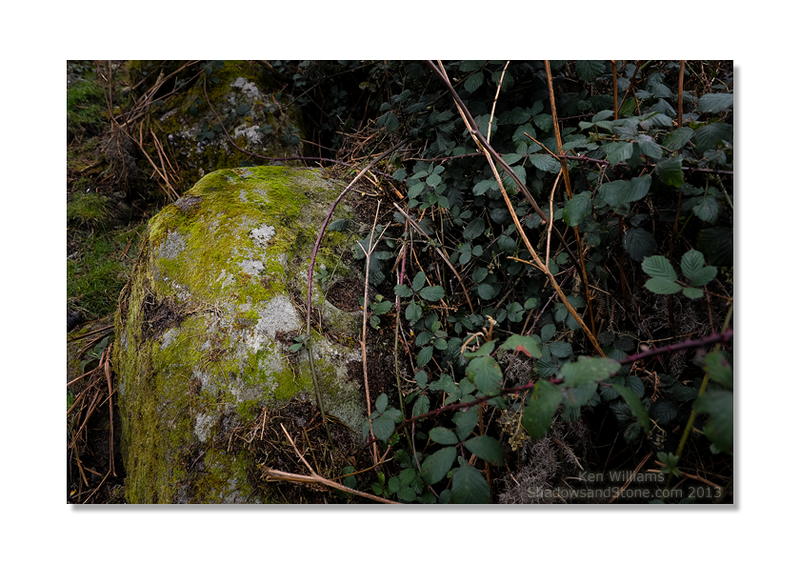 The large boulder in its present setting within a wide, overgrown field boundary chock full of field clearance. The boulder itself is approximately 1.8 meters in length and its carved face is about 1 meter wide. The enormous centre cup or basin is 15cm in diameter. The official entry in the databases of Archaeology.ie describes a single outer ring, however as you may see from my recent photos there is a faint second ring , part of which results from clever use of the curved end of a vein of quartz that runs the length of the stone surface. 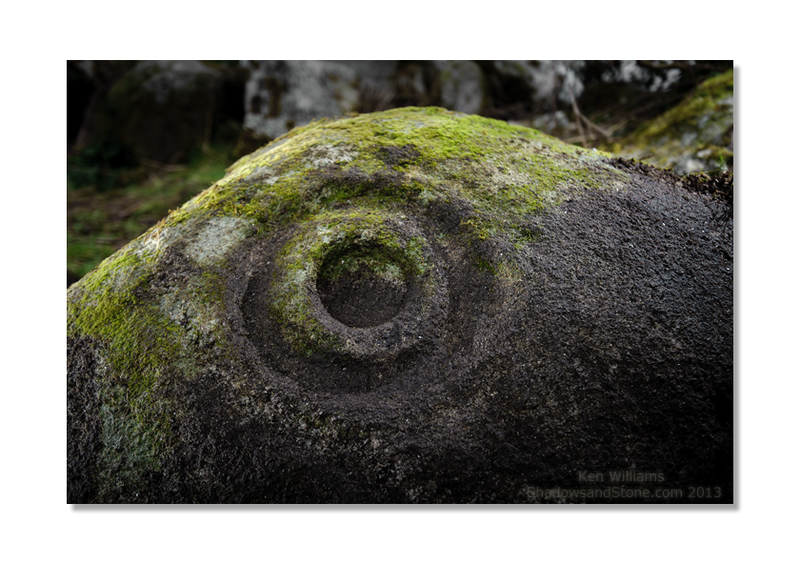 Although it seems to become overgrown quite quickly, the surface of the stone has relatively little moss or lichens growing along the middle band of the stone on which the carvings are found. Lower on the stones surface is a wide groove, apparently artifical, running at an angle for about 20cm before disappearing below the current ground level. A ‘cup mark-like’ depression is also obvious in the photos, about 30cm to the right of the main motif, while very faint traces of possible and suspect carvings to the lower left of the rings shows on the photos. This inverted ‘U’ shape with small cup mark/dot was not apparent while I was actually in front of the stone but seems reasonably suggestive, enough to warrant a further inspection with more targeted lighting or photogrammetry. Not spotted while I was photographing the stone, some possible carving, an inverted U shape with cup mark, is just visible to the left of the main cup and ring motif. Slightly softer lighting shows the finely finished carving work, the depth and size of the main motif is unusual in the typical rock art repertoire. 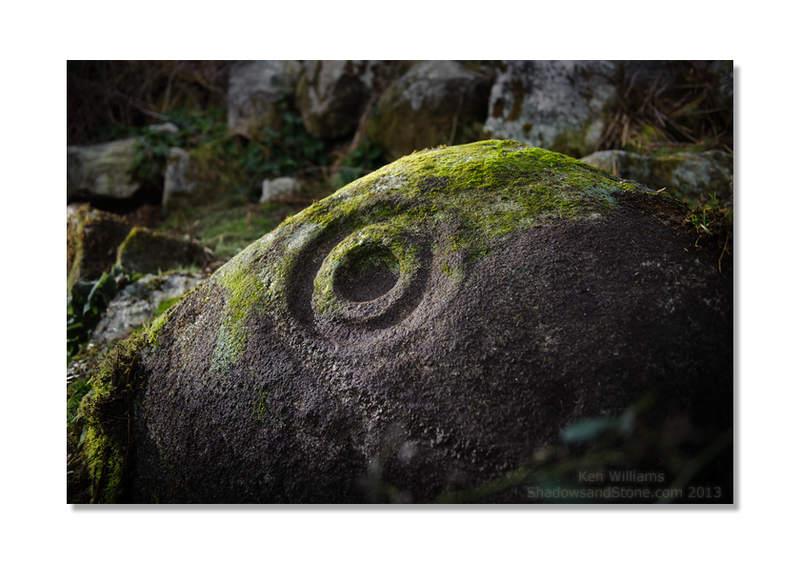 While the general type of motif and its location are typical of the local rock art tradition across Carlow and Wicklow, I have to admit to having some very slight niggling feelings that this particular example may not so clearly be what it may seem. Perhaps it is the exceptional depth of the carvings and its good state of preservation on the relatively tough and weather-resistant granite but it almost seems too well executed and perfectly formed. The steep-sided central cup and ring seem subtly different to the more typical shallow groove technique of the genre. On the other hand, every carving of this type has a more or less unique combination of attributes in location, surface type, composition and complexity, so it is to be expected that differences will often be apparent that may feel intuitively odd or out of place. It surely is ancient in origin in any case and a particularly fine example that is well worth a visit. Access is via the farmyard to the south where permission can be sought. The link should be live now! Have you come across the idea that this kind of rock art might represent something unusual seen in the skies – like a meteor, or a comet? Given the events of the last few days … Russia in particular with the spectacular explosion. The other one was too far away, but if it had been closer, there might have been effects in the sky similar to cup & ring marks. I have no references for this, it’s just gossip and conjecture. Interesting nevertheless. That’s a very interesting comment. 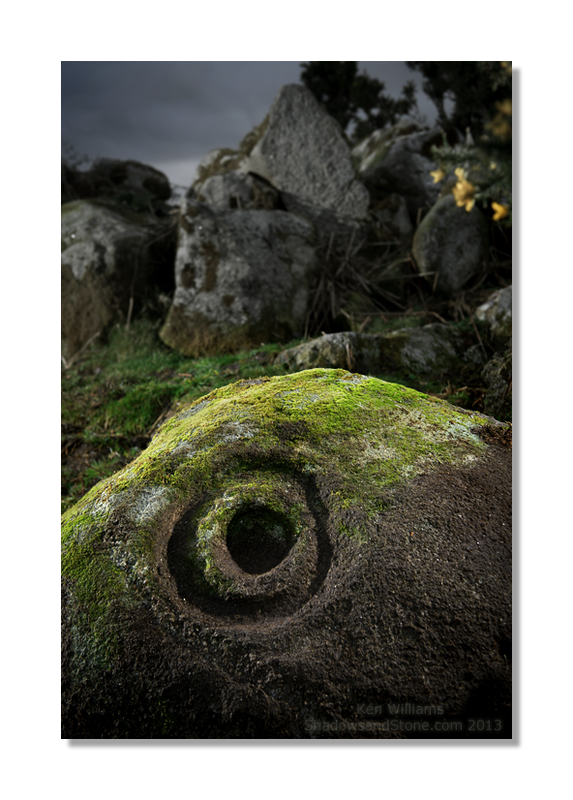 I also see the eye of a mammal or sea creature in this particular stone. Many of the stones also look like maps! Stunning photos. I’m from Carlow and would love to see this. I know there are other examples of rock art around. My father brought me to see them many years ago and I need to get back and see them. They are very poorly signposted or protected..
Hi Anthony, great to hear from you. I was just listening to a podcast interview you did on YouTube a couple of weeks ago. An archaeologist assures me it is ancient but, like you, I remain suspicious. It feels alien to all the other carvings in the wider area. Hoping to keep the blog more current from now on! With the grooves so wide and deep, it’s just the sort of fake antiquity that could well have been done in the 19th century or even more recently. I guess the word ‘anomalous’ might appropriately be applied to it. You haven’t come across any others like it, I guess ?